Sarah Sarah and her intrepid crew are entering their seventh day a sea from Hawaii. The predicted frontal passage has occurred, just a bit early. 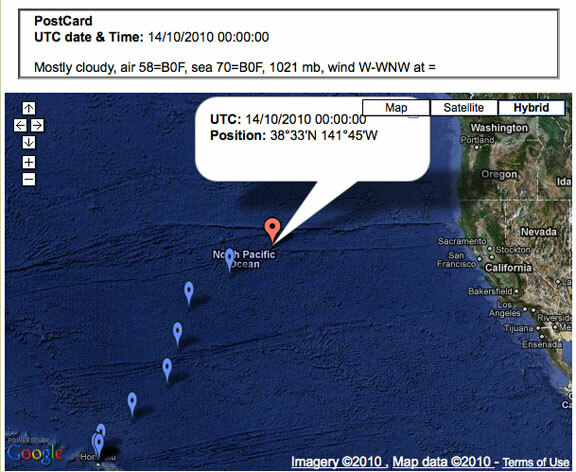 Boat speed and good weather routing now has Sarah Sarah positioned within the influence of a high pressure system. They should be able to make their landfall without further frontal boundaries and their gales. We thought we’d give you an early, and more detailed, report of our recent weather conditions. For the first time in memory since departing New Zealand, we’ve had the weather on our port beam for the past 12 hours, or so. During the night we encountered more-intense rain with high winds. The swells are currently about 1.7m from WNW, with the wind maybe about 18 kts. from about W. During the past two hours we’ve had the barometer climb from 1014mb to 1023mb, the latter seeming to agree pretty closely with the GRIB data we obtained yesterday. 1. Weather Summary as of 13 October 2010 1200Z. abates and backs to SWerly to 5-10kt range by Thursday evening (15Oct0600Z). WNW 2.0m to W 1.5m. Wind waves abate from NW 2.0m to SW 0.5m. Your position report was received through YOTREPS. Should be smooth going. 1. Weather Summary as of 14 October 2010 1200Z. ridge. Expect winds to abate to the 5-10kt range and variable direction. Wave heights mostly Werly swell at 1.5m. Wind waves 0.5m. Another day will see a three quarters of the way party. This entry was posted on Thursday, October 14th, 2010 at 5:12 pm and is filed under FPB 64 Updates. Both comments and pings are currently closed.